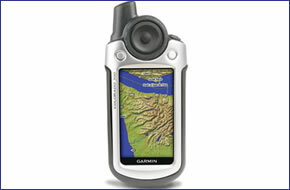 Garmin Colorado 300 is the most advanced, yet user-friendly handheld GPS from Garmin. Built for serious thrill seekers on the trial, on the water and on the road. Packed with features, the Garmin Colorado 300 includes a built-in basemap, high-sensitivity receiver, barometric altimeter, electronic compass, SD card slot, colour display, picture viewer and more. The Garmin Colorado 300 compact high-resolution TFT colour display handheld GPS device accepts preprogrammed microSD cards for adding optional maps on the go. The Garmin Colorado 300 is powered via two AA batteries. Accessories are still available for your Colorado 300 click here. The Garmin Colorado 300 is your personal guide to adventure and provides exceptional handheld GPS navigation in a lightweight, waterproof and compact designed GPS handheld navigator that runs on two AA batteries (not included). The Garmin Colorado 300 stores up to 1000 waypoints, 50 routes and 10,000 tracklogs. The Garmin Colorado 300 features a Rock ‘n Roller interface, using this revolutionary input wheel, almost all functions can be performed using just your thumb. You can also customise the Colorado 300 interface based on your favourite activity and view photos of your excursions with its picture viewer. Slim, lightweight and waterproof, Colorado 300 is the perfect companion for all your outdoor pursuits. With its high-sensitivity, WAAS-enabled GPS receiver, the Garmin Colorado 300 locates your position quickly and precisely and maintains its GPS location even in heavy cover and deep valleys. The advantage is clear - whether you're in deep woods or just near tall buildings and trees, you can count on Colorado 300 to help you find your way when you need it the most. The Garmin Colorado 300 has a built-in electronic compass that provides bearing information even while you're standing still, and its barometric altimeter tracks changes in pressure to pinpoint your precise altitude. You can even use the altimeter to plot barometric pressure over time, which can help you keep an eye on changing weather conditions. Adding maps is easier than ever with Garmin Colorado 300's SD card slot. Conveniently plug in optional preloaded SD cards including full street and Ordnance Survery topographical data. Just insert a MapSource card with detailed street maps, and Garmin Colorado 300 provides turn-by-turn directions to your destination. The SD card slot is located inside the waterproof battery compartment, so you don't have to worry about getting it wet. Do you have a question about the Garmin Colorado 300 or other handheld GPS related question that's not been answered on this webpage? Please see our handheld and Outdoor GPS FAQs for questions from other customers. Plus if the answer to your question isn't featured, use the online form to ask us for the answer. Alternatively please telephone 01733 777623 Monday to Friday (9:30am-5:00pm) to speak to one of our sales team. The Garmin Colorado 300 is pre-loaded with the Atlantic Recreational Routable Basemap v2 which includes Europe, extreme western Russia, Africa, and the Middle East, and covers an area from N75 to S60 Latitude, W30 to E60 Longitude. Also included is a high-level worldwide map with political boundaries and major cities. Looking for accessories and spares for the Garmin Colorado 300? Many parts are available including a hard carrying case, retractable lanyard, handlebar mount and handheld fixed mount. Discover the optional range of maps that you can add to the Garmin Colorado 300 here. Maps available include GB Discoverer Ordnance Survey (OS) mapping and City Navigator street-level road mapping. Question: Are you still selling the Colorado 300? if so what is the price please, also what would be the cost of UK 1:50 OS Maps? Answer: The Garmin Colorado 300 was discontniuned many years ago by Garmin, it has been replaced and supseded multiple times by many new Garmin handheld GPS devices. We do sell the latest TOPO Great Britain 1:50K map title (released Spring 2018), however Garmin do not list the Colorado 300 as a compatible model. I would suggest that you consider buying a different Garmin handheld model. Question: Do you have a rock 'n' roller wheel for Garmin Colorado 300? The rubber on mine is torn. Answer: I’m afraid we do not sell rock 'n’ roller wheels for Garmin Colorado 300. Can I suggest you telephone and speak directly with Garmin UK on 0808 238 0000 to see if they can help. Do you have a question about the Garmin Colorado 300? Submit your question via our contact page.